As explained by Tom Bedall in a prior article in the Legal Hotline Connection (see Capturing Senior Legal Hotline Elder Abuse Data, December, 2013, December 2013 Legal Hotline Connection), at Pro Seniors (the statewide senior legal hotline for Ohio), we use dropdowns on the case information screen to capture allegations of abuse, neglect or financial exploitation. This allows us to easily report data on abuse allegations, and it also allows us to capture allegations of abuse when the legal problem is not specifically abuse or exploitation. 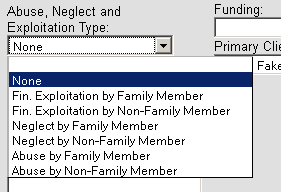 By using dropdowns, we can capture whether the allegation involves abuse, neglect, or financial exploitation, and we can capture whether the perpetrator is a family member or non-family member. 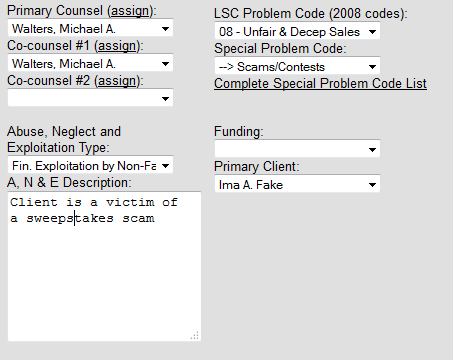 The dropdowns allow us to capture abuse allegations, but the dropdowns are only useful if the hotline attorney is alerted to possible financial exploitation issues that might contribute to the primary legal problem that generated the call. It is necessary that the hotline attorney be sensitive to the “rest of the story” when talking to a client. Financial exploitation particularly can be an underlying cause of many different types of legal problems, spanning all categories of the LSC problem codes. From abusive debt collection practices, to Medicaid denials resulting from financial exploitation of the client by family members, to slumlords who collect rent and do not provide habitable premises, financial exploitation can be a cause of numerous legal problems for seniors. But when a senior calls a hotline, the senior is likely focused on the immediate legal problem. The senior may not identify the exploitation unless asked. It is therefore important to ask follow up questions to accurately identify cases where financial exploitation may play a role in the legal problem. For example, if a senior calls a hotline for advice or a referral to change or revoke a power of attorney, it‘s important to know why the senior wants to change the power of attorney. In many cases, the reason a client wants to change power of attorney from one family member to another has a basis in past misuse of the client’s funds. If a client is being denied institutional Medicaid due to an improper “transfer” of resources, it is important to know the circumstances of the transfer. The “transfer” may not have involved a voluntary transfer at all. The senior may have been a victim of financial exploitation by family members. If a client is seeking help in dealing with a collection agent, it is important to know what the collection agent is saying to the client. False threats of prosecution or garnishment of Social Security benefits are not just violations of the Fair Debt Collection Practices Act. False threats to collect an alleged debt are also financial exploitation. In other cases, the financial exploitation is self-evident based on the facts alleged by the client. But the hotline attorney needs to think beyond “classic” financial exploitation issues to properly identify the financial exploitation in the facts. For example, if a client calls because a home contractor was paid in advance for work, and then abandoned the job, that’s financial exploitation. If a client calls because a used car dealer sold the client an unsafe vehicle after concealing the safety problem, that’s financial exploitation. If a client is living in an apartment without heat, the landlord who is charging the client for rent under such circumstances is financially exploiting the tenant. It is important to respect the client’s dignity and confidentiality. If a client does not want to discuss financial exploitation, that is the client’s right. It doesn’t help a victim of financial exploitation to ignore the client’s autonomy. But in many cases, identifying financial exploitation cases is simply a matter of thinking beyond traditional concepts of financial exploitation and asking a few additional questions to find out the backstory to the legal problem.